I cannot think of a commitment my mother has ever broken. The importance she places on her commitments is one of her best qualities. I am proud that I inherited this quality. However, my goal for 2018 is to actually allow myself to break a few commitments. This picture was taken at my very favorite birthday party, “Camp Kudner” (Kudner is my maiden name). For my fifth birthday, I asked my mother if we could do a camping theme. She agreed. 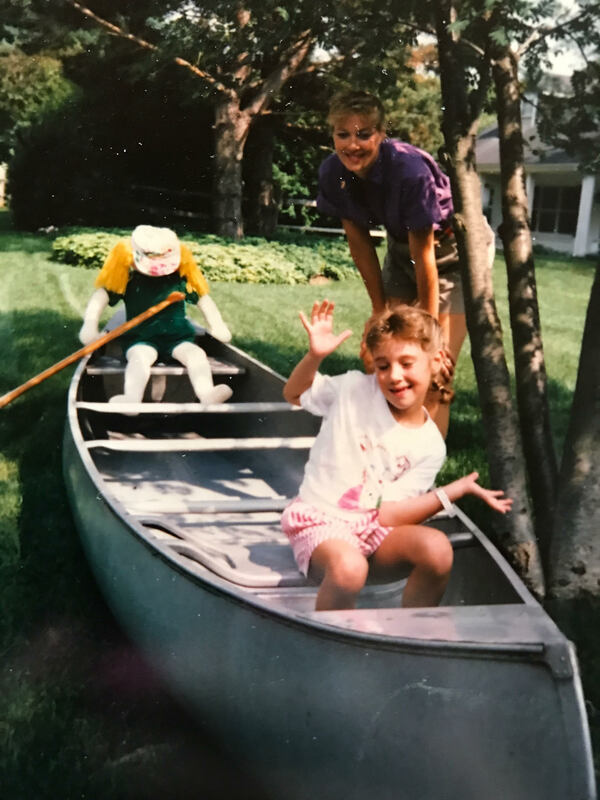 With her creativity and relentless desire for excellence, two qualities I am also thankful I inherited from my mother, she puffy painted 24 “Camp Kudner” t-shirts for my guests, scoured the neighborhood to borrow a half dozen canoes, and made our backyard into a perfectly whimsical summer camp theme. Unfortunately, she started feeling very ill the day before the party and was rushed to the hospital. It turned out that she had appendicitis. However, a little appendicitis was not going to deter my mother from delivering on her promise. She was back home two hours after her surgery. Despite fainting while cutting my birthday cake and throwing up a few times, she did not break her promise. It was a fabulous party. Until just recently, I never even knew idea my mother was sick that day. She pushed through like a trooper. Like my mother, I take my commitments very seriously and can push myself beyond normal physical limits to fulfill them. This has served me well throughout my career and continues to be one of the things I am most proud of. I have completed Half Ironmans and have achieved seemingly impossible things as an entrepreneur. However, because it so important for me to make commitments I feel confident I can keep, I sometimes fail to aim high enough. Through life experience and the work we do in Conscious Leadership, I now realize that the importance I place on keeping my commitments can actually be a liability. Working with my business partner Sue has been my first step to keeping this in check. Sue and I both have the ability to push ourselves beyond normal physical limits, but Sue is less afraid to shoot for the stars. On more than one occasion, she has actually succeeded in reaching those stars. When she fell short, she at least made it 75% of the way there. That is the lesson I am going to try to remember in 2018. If I keep shooting for stars, it will be impossible for me to succeed every time. However, I am confident that my passion, grit and perseverance will propel me all of the way there, at least every once in a while. And....if I get 75% of the way there, it is still 75% further than I sit today. Here is to thinking big in 2018.